The Casa de Serralves, in the park of Serralves in Porto’s western suburbs, lies testimony to the enterprise and international good taste of its builder, Carlos Alberto Cabral, 2nd Count of Vizela. The villa forms part of the Serralves Foundation, and adjoins Alvaro Siza’s Museum of Contemporary Art , together set in the 18 hectares of landscaped gardens which make up the Serralves Park. 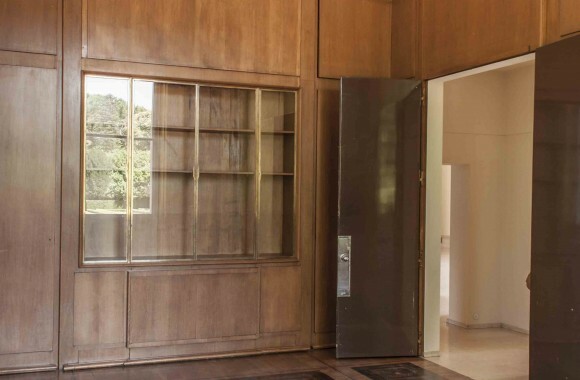 The villa, constructed between 1925 and 1944, is a rare example in Portugal of Streamline Moderne domestic architecture, but with interiors reflecting neo-classical, romantic and art deco elements. The villa and its grounds reflect Cabral’s enthusiasm for contemporary architecture and decorative arts at a time Porto and its region was experiencing a commercial and industrial boom and a period of great social transformation, reflected in the rich variety of post First World War architecture in Porto which will feature in the Society’s forthcoming trip to the City in September. A somewhat independent member of Porto’s conservative industrial élite, Cabral’s avant garde social and cultural aspirations were a mark of the ambition and standing of this owner whose fortune was made in the textile industry, and whose nobilty was a reward for the family’s role in the industrial modernisation of Portugal. Serralves was from the early 19th century the summer residence of the Cabral family. 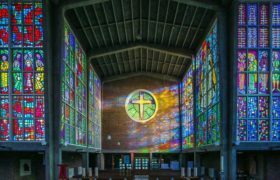 When he inherited the property in 1925, Carlos Alberto Cabral set about expanding the property by purchasing adjoining land and improving and extending the buildings within the site which comprised amongst others the original 19th century house and its adjoining chapel. Cabral was in tune with artistic currents which prevailed from the 1920s through to the 1940s. In 1925, while in Paris, he visited the International Exposition of Modern Industrial and Decorative Arts, and subsequently became acquainted with figures who were to prove instrumental in articulating his vision and ideas for Serralves, including architects and designers Charles Siclis (1889-1942 and Jacques Emile Ruhlmann (1879-1933), and Jacques Gréber (1882-1962) landscape architect who was invited to design the new gardens adjoining the villa. With the support of his local architect José Marques da Silva (already notable for his Beaux Arts inspired designs for Porto’s São Bento railway station and commercial office developments in line with Barry Parker’s restructuring of Porto’s civic centre), he set about the transformation of Serralves. Marques da Silva was initially co-ordinating extensions and improvements to the nineteenth century house, but in 1929 Cabral asked Charles Siclis (known in Paris for his cafés and theatres and who had just opened the Théatre Pigalle, as well as working from Biarritz where Cabral had property) to sketch an idea of what was in effect a new villa, drawing together the various ideas drawn up by Marques da Silva, initially with a view to disguising the present facades. These designs, two watercolours of the north and south elevations established the current appearance and pink colours of the villa, the massing, the fenestration, the expression of the central hall and the tower in Art Deco style of the enclosed chapel. These designs encapsulated what were to become the referential image of today’s villa. For the interiors however, Cabral turned to Ruhlmann, who designed them in a style closer to French neo-classicism, refined, spacious and elegant, quite a contrast to the machine ‘moderne’ of the Siclis exterior. Marques da Silva continued to integrate the various proposals arising from Cabral’s commissions and in the summer of 1931 submitted the project to the Porto City Council, work starting on it before the end of that year. Interestingly though, it was still Cabral who insisted on managing the relationship between the various contributors to the project, often giving contradictory information and deciding himself on different approaches to construction – Ruhlmann, for example, wanted a construction system different from that of Marques da Silva. Gréber’s plans for the grounds date from 1932 – he had designed several gardens in Europe and North America. They departed considerably from what was common in Portugal at the time, combining neo-classical and modern designs which impress today with their elegant central and lateral parterres setting off the house, avenues and groves of sweetgum and beech, gardens of rose and camellia and an arboretum. In 1933 Ruhlmann died and his work was taken over by Alfred Porteneuve who had visited the site in 1935. 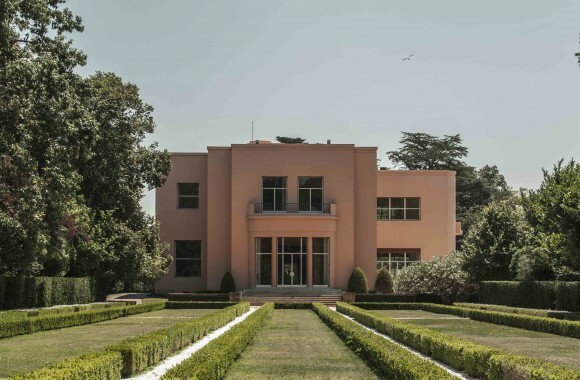 As well as being responsible for establishing the now familiar pink colour of the modern villa’s facades after Siclis’ early suggestion, Porteneuve’s arrival coincided with the radical yet perhaps inevitable decision to demolish completely what was left of the original buildings and create the structure of the interior that we see today. 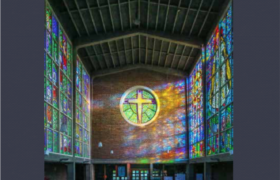 Only the original chapel structures remained, encapsulated in their Art Deco exterior and belfry, but preserving their original form as a 19th century chapel. It had been used regularly by local people and Cabral, it seems, for that reason, did not want to demolish it. The Villa is on three floors – ground floor including all the living rooms, dining room, hall and library; private quarters on the first floor; and the basement contained the kitchen, pantry and service areas. Entering the Villa through the main entrance, one is struck by Ruhlmann’s elegant new-classical lines in the impressive two-storey central hall with René Lalique’s large skylight, beyond a view to the central parterre and grounds, to the right the large salon with a view to the lateral parterre, to the left the dining room overlooking the garden, and Edgar Brandt’s fine wrought iron gate which separates the social zone from the Villa’s private quarters and library. The post-war industrial environment was not kind to Cabral’s fortunes, and like many textiles firms in this country, he was affected by failure to adapt to changing global conditions and industrial progress. He was forced to sell the property in 1953, having enjoyed only seven years of the project he inspired and brought to fruition. 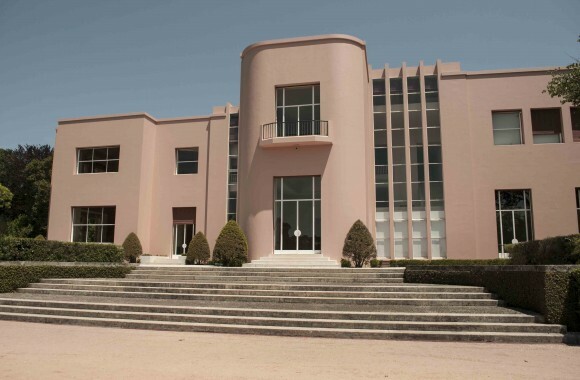 The subsequent owner, Delfim Ferreira, also son of a textile magnate, was however able to consolidate and preserve intact Cabral’s work, until it was purchased by the Portuguese State in 1987. 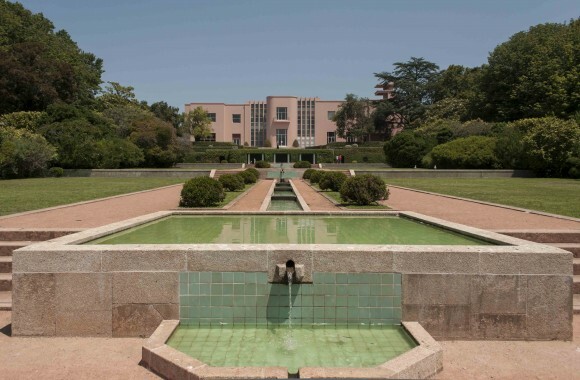 The government acquired the property with the aim of creating the Serralves Museum of Contemporary Art, as a National Museum of Modern Art. Today as one of the country’s most important cultural institutions and impressive parkland estates, Serralves – the Villa, its grounds, the Park, Alvaro Siza’s Museum of Contemporary Art, jointly classified in 1999 by the State as a ‘Building of Public Interest’, is classified as of 2012 as a ‘National Monument’. ‘Marques da Silva coordinated the project and took responsibility for the completed work, Charles Siclis may have sketched the image of the façades, Jacques Emile Ruhlmann may have suggested the scale and the nature of the main rooms in the house, Alfred Porteneuve may have detailed the design, Jacques Gréber may have defined the form of the gardens, but the decisive character that brought everything together was Carlos Alberto Cabral, the client of Marques da Silva. Cabral had the vision, the taste, the desire and the necessary resources to conceive his house’.